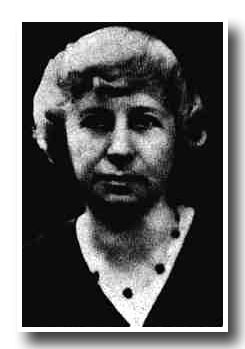 Margaret Floy Washburn (July 25, 1871 – October 29, 1939), was a leading American psychologist in the early twentieth century, best known for her experimental work in animal behavior and motor theory development. As the first woman to be granted a Ph.D. in psychology, she pioneered the involvement of women in the discipline, and her work at Vassar College made it a leading institution in psychological research. Her views on the importance of scientific study of internal mental functions together with external behavior in order to understand human behavior were radical for her time. Born in New York City, Margaret Floy Washburn was raised in Harlem by her father, Francis, an Episcopal priest, and her mother, Elizabeth Floy, who came from a prosperous New York family. Margaret was an only child. She entered school at age 7 and at age 9 moved to Kingston, New York, when her father was placed in a parish there. She graduated from high school in June 1886, at age 15, and that fall she entered Vassar College in Poughkeepsie, New York, as a preparatory student in chemistry and French. At Vassar, Washburn became interested in experimental psychology and she determined to study under James McKeen Cattell in the newly established psychological laboratory at Columbia University. As Columbia did not yet admit women graduate students, she enrolled only as an "auditor." She did well and Cattell encouraged her to enter the newly organized Sage School of Philosophy at Cornell University, which she did in 1892. At Cornell, Washburn studied under Edward B. Titchener, his first and only graduate student at the time. She conducted an experimental study of the methods of equivalences in tactual perception and earned her master's degree in absentia from Vassar College in 1893 for that work. She did her doctoral thesis on the influence of visual imagery on judgments of tactual distance and direction. This work was sent by Titchener to Wilhelm Wundt and published in Philosophische Studien (1895). In 1894, she became the first woman to receive a Ph.D. in psychology, and was elected to the newly established American Psychological Association. Washburn took teaching posts at several universities: Wells College, Cornell’s Sage College, and the University of Cincinnati. At Cincinnati, she was the only woman on the faculty. In 1903, she returned to Vassar College as associate professor of philosophy, where she remained until 1937. She opened a new department of psychology at Vassar in 1908, acting as its first director. In 1937, she suffered a major stroke, what necessitated her retirement (as emeritus professor of psychology). She never fully recovered and died at her home in Poughkeepsie, New York, on October 29, 1939. She never married, choosing instead to devote herself to her career and the care of her parents. Washburn was a major figure in psychology in the United States in the first decades of the twentieth century, substantially adding to the development of psychology as a science and a scholarly profession. Washburn used her experimental studies in animal behavior and cognition to present her idea that mental (not just behavioral) events are legitimate and important psychological areas of study. She published those ideas in her book The Animal Mind (1908). This, of course, went against the established doctrine in academic psychology that the mental was not observable and therefore not appropriate for serious scientific investigation. Besides her experimental work, she read widely and drew on French and German experiments of higher mental processes, stating that they were intertwined with tentative physical movements. She viewed consciousness as an epiphenomenon of excitation and inhibition of motor discharge. She presented a complete motor theory in Movement and Mental Imagery (1916). During the 1920s she continued to amass experimental data from around the world to buttress her argument. She remained anchored in behaviorist tenets, but continued to argue for the mind in this process. She took ideas from all major schools of thought in psychology: behaviorism, structuralism, functionalism, and Gestalt psychology, but rejected the more speculative theories of psychodynamics. Her understanding was that motor reaction, and thus, one can say human behavior, is a product of both cognitive and learned components. Therefore, Washburn claimed, not only one but both approaches to psychology, behaviorism and introspection, should be involved in studying human behavior. Washburn's published writings span 35 years and include some 127 articles on many topics including spatial perception, memory, experimental aesthetics, individual differences, animal psychology, emotion, and affective consciousness. Echoes of Washburn's insistence that behavior is part of thinking continue in the “dynamic systems” approach that Thelen and Smith (1994) have used to explain the development of cognition in humans. At various times in her career, she was a coeditor for the American Journal of Psychology, Psychological Bulletin, Journal of Animal Behavior, Psychological Review, and Journal of Comparative Psychology. She served as president of the American Psychological Association in 1921, an honorary title at that time. She was the first woman psychologist and the second woman scientist to be elected to the National Academy of Sciences in 1932. Washburn was the first woman ever to receive a Ph.D. in psychology, in that way opening the door for many female scholars to enter this arena. Washburn, M. F. 1903. "The genetic function of movement and organic sensations for social consciousness." American Journal of Psychology 14: 73–78. Washburn, M. F.  1978. Movement and mental imagery: Outlines of a motor theory of the complexer mental processes. Beaufort Books. ISBN 0405051689*Washburn, M. F. 1932. History of Psychology in Autobiography, vol. 2: 333–358. Worcester, MA: Clark University Press. History of "Margaret Floy Washburn"
This page was last modified on 4 April 2008, at 02:24.